Today kicks off a week from NAASO (The Obesity Society) as I'm writing from New Orleans where they're having their annual scientific assembly. Every year I come to this conference I'm amazed at the incredible amounts of brains and passion that are being poured into obesity research worldwide. The conference is enormous and boasts over 2,000 attendees from the four corners of the world. This week I'm going to try to highlight some of what I feel are among the conferences most interesting presentations and studies. 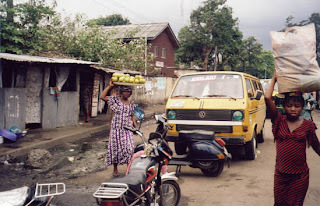 The first takes us to Nigeria - rural Nigeria in fact, where Lara Dugas and her colleagues went to study the effects of the energy expended in daily activity on weight gain. They followed 153 rural Nigerian women (over 20% of them subsistence farmers) and measured their total daily energy expenditures (the total calories they burned all day long), their resting daily energy expenditures (the calories they burn at rest) and then inferred the calories they burned through daily activity. They then compared the data from rural Nigeria with the same data taken from a group of women from urban Chicago (where over 50% of them were unemployed). They then followed these women for 3 years. Some of the results were not surprising. The Nigerians were much lighter - average weight was 128lbs and BMI of 23.1 vs. those from urban Chicago where average weight was 184lbs and BMI of 31. Calories burned through daily activity did not differ between the skinny rural Nigerian subsistence farmers and the obese unemployed urban Chicagoans. Come again? The subsistence farmers and the unemployed urbanites burned the same number of daily Calories in activity? Haven't we been blaming obesity at least partially on the poison fruits of development? Aren't dish washers, escalators, cars, and elevators stealing our Calories away from us? Shouldn't the skinny Nigerian farmers be burning far more Calories? Isn't that part of why they're so skinny? I sure would have thought so - and from the reactions in the room, so did most other folks. No measure of energy expenditure, not resting, total or that from activity, was associated with weight change in either group over the 3 years and in fact, the rate of change in body weight over the 3 years was virtually identical in Nigeria and Chicago. Why isn't that surprising? What that result says is that the Calories you burn don't dictate your weight and that instead what dictates your weight are the Calories you consume. The only surprise here is the fact that rate of weight gain is the same in rural Nigeria vs. urban Chicago where one might have thought greater access to high Calorie foods would have led to a dramatically more rapid gain in Chicago (though I should note, the Chicagoans had higher total energy expenditures as a consequence of their higher weights and consequently for them to gain weight at the same rate as the Nigerians does in fact necessitate eating more, just not tons more). So if you take these results as valid (and it really was a very well designed study), they basically conclude that the environment as it pertains to activity, doesn't matter, that you can't blame the escalators, and shocker of all shockers (there's the sarcasm), energy intake matters far more than energy output in the establishment of obesity.